The time is ripe for measured political discussion in our classrooms! 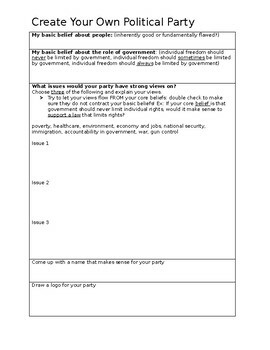 After a discussion of the ideologies of the main political parties, use this resource to prompt students to create their own political party. My students and I realized that there are some real contradictions in the beliefs and actions of both major political parties. Why do both parties shout for individual freedom on one issue, but turn around and clamor for government regulation of individual freedom on another issue? It seems that political convenience may drive some issues rather than the conviction of core beliefs. This resource has students start with the basics: What do you believe about human nature? What you do you believe about the role of government? From there, students can choose to define their party platform on whatever issues will be a priority for their party. Sample issues are listed, but students can certainly add on as they wish. Finally, students will develop a suitable name and logo for their political party. My goal here is to prompt students to think deeply about their political beliefs and use those core convictions to come to their own conclusions about the issues of today. Please follow my store and check out my other listings! Remember Buyers! You receive one TPT Credit for every dollar you spend. You only get the Credits after you provide feedback (rating and comment). You can use those Credits to reduce the cost of future purchases on anything from the TPT site!